I’ve commented to friends that if I ever needed to enter the dating world again I would need to be sandblasted with diamonds. But that’s another story. I digress. How does one entertain a toddler without regular backup? Play dates. Once you have a child play dates become more common, and in some cases, more desired that nights on the town with your beloved. Meeting for coffee when wee ones are little nubbins in car seats helps stave off loneliness and encourages basic hygiene. Later, as babies start to crawl, it’s fun to take them to others’ homes for them to chew on someone elses’ toys and again, get out of the house. In the first year play dates are more about the adult in the equation – sharing adult time where you can talk about anxieties, hopes and everything in between. And now that I have a full-fledged toddler, each minute is about how to tire her out. I’m not an over-scheduler, but think of how to get her active and entertained so that she goes down for her afternoon nap and sleeps through the night. A surefire way to get this done is through play dates. I’m fortunate that three other women were pregnant at the same time I was. We started by meeting for tea, newly pregnant and burping into warm cups. As we got bigger we shared ideas. And we overlapped on maternity leave, meeting weekly. Since then, we still meet monthly for Birthday Club, our toddlers born six weeks apart and two of them on the same day. 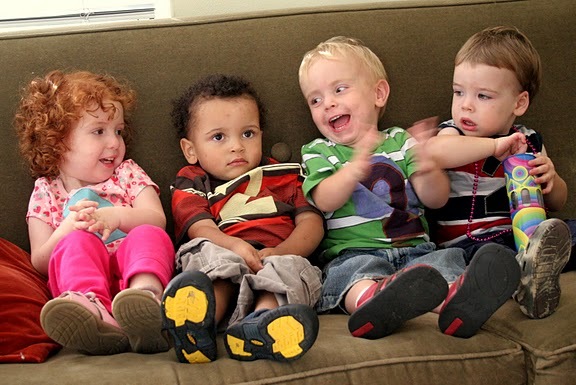 Each month we take a photo of the four kids, smiling as they wiggle and waggle. So on this weekend I did what I knew I could to tire out said toddler and keep us entertained: I scheduled three play dates, one for each day I was home alone. Lovely mamas and their children came over and we also went out to meet a little friend. We walked, talked, the kids stared and stole from one another. Tears were shed from minor spills and injustices, but kisses were blown and little hugs shared when they parted ways. For one or two hours, I was happy and content, and so was my two-year-old partner. Frankly, it’s the best dating scene I’ve ever been a part of.